This is my Great-Great- Grandma, Eliza Agnes Kenney (1861-1941). I don't know much about her, other than she is one of my ancestors on my dad's side of the family. When my aunt passed away two summers ago, I was gifted with a few items that belonged to Eliza, including a serving plate and a vanity table. My grandpa is really into genealogy and sent me this photo of Eliza from his archives. It was so nice to be able to see what the woman who owned these family treasures looked like. I really like her duster coat and how she is looking away from the camera. I so enjoy seeing photos of my ancestors -- it's so fascinating! It is always fun to look through the family archives...one of my favorite things to do. 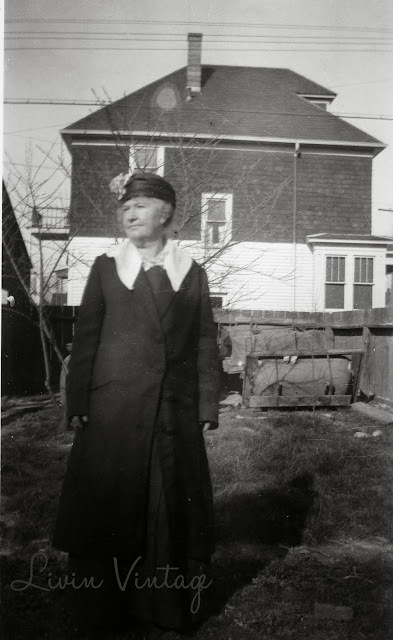 I have been mulling over a post about the women in my family. I still need a few more photos though. How interesting to see a picture of your Great Great Grandma. The photograph is really well done for 1920. And, actually the backdrop could even be very much like today. It would be so lovely if you could do a little digging and let us know more about Eliza Agnes Kenney. The ladies of her day always have a great story to tell. I could spend hours looking at old pictures, it used to be one of my favorite things to do with my Grandmother Jordan. My Great Grandparents had money and would take lond driving trips across country during the 1930's 40' 50's and its neat to see what they wore, where they went and how even thought they had money in the bank they were still simple people.